Assets to help you navigate the world of records management and information governance software. If your firm has developed comprehensive IG policies, don’t drop the ball by failing to apply them consistently. Achieve total compliance by applying your IG policies to life cycle of everything, including records in DM systems, share drives, litigation systems, SharePoint, and storage facilities. In today’s environment, being fully IG compliant is crucial. Unfortunately, many law firms are falling short. Patrick Tisdale discusses a range of information governance (IG) issues pertaining to law firms in this enlightening interview. With so many options on the market, there’s a lot to consider when you're upgrading your records management software. 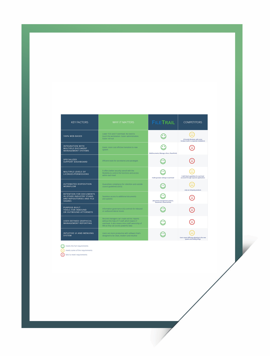 This comparison chart provides key considerations to help you make an informed decision. Miller Nash wanted an streamlined records management solution that integrated its DM and RM systems to manage all physical and electronic files. Amlaw 100 law firm Jackson Lewis needed to completely revamp the way it managed its physical records. Waller Lansden Dortch & Davis sought to replace its aging records management software. It wanted a cutting-edge solution that integrated with NetDocuments to deliver a seamless user experience. After evaluating several leading solutions, the firm selected FileTrail.